You know how when you sign up for an online service or activate a new phone or credit card, or basically any time you buy anything ever, you have to sign an endless, detailed, coma-inducing document known as the terms and conditions? No one ever reads it, but next thing you know, you’ve agreed to plant 100 trees, karate chop the elderly, and let Apple/Verizon/Walmart tattoo its logo on your face. Marriage is kind of like that. to love and to cherish; from this day forward until death do us part. But here’s the fine print. #1) You are now your spouse’s primary physician. You are now required to analyze your spouse’s intimate health concerns with them. When your spouse comes home and confesses to you that they haven’t had a normal bowel movement in 3 weeks (usually it’s the husband, amiright ladies?) or they’ve discovered a mole/lump/growth in a deep crevice somewhere on their body, your first reaction may be, “Why are you telling me this? I’m not a doctor!”. But there you are 20 minutes later, flashlight in hand, squinting as you google pictures of cancerous moles or asking questions about color and consistency. 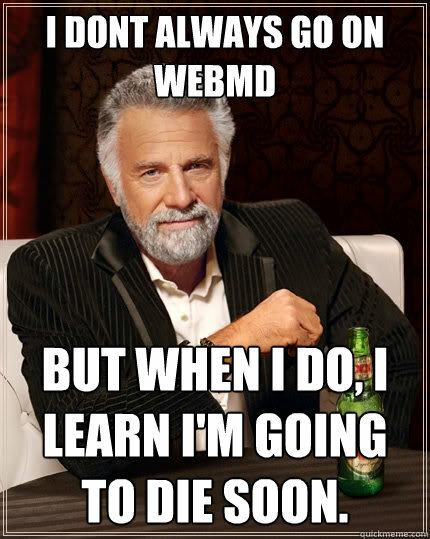 Word of advice: stay away from WebMD. #2) Bodily functions happen and you must deal with them. Your alarm goes off at 6:30 AM. You hit snooze and roll over to snuggle your still sleeping spouse, stealing some peaceful moments while the world is quiet and the sun has just started to peek through the blinds. Your spouse snuggles a little closer to you, lets out a quiet, contented sigh and then…farts on your leg. Now, I’m not saying this scenario happened in my marriage last week, and I’m not saying that the guilty party texted her best friend and sister-in-law to tell them all about it later that day, all while stifling giggles in an effort not to wake the sleeping baby in her arms, but I’m not NOT saying any of that happened, if you know what I mean. Look, bodily functions are a normal part of life and you can’t spend the rest of your marriage sneaking into the bathroom to pass some gas or shifting in your seat to let out a silent one. And your husband is living in a fool’s paradise if he thinks you don’t fart. #3) The silent stand off over the dishes (or some other, equally unpleasant chore). I hate doing the dishes. So does Christopher. The first house we lived in after we got married did not have a dishwasher. Which meant every few days, the dishes would pile up in the sink and we would begin our own Cold War. We’ve never admitted this officially, but we both knew we were just waiting until the other one cracked. More often than not, I was the one to give in, because I would need a certain dish to cook and there were too many dishes in the sink to wash just one. Christopher had the upper hand however, having lived with roommates for a year and a a half before we got married. #4) The struggle of the snacks. One of the simple pleasures of life is having a special snack that only you enjoy. That way, you can keep it in the house and not worry about coming home to an empty bag or box one day. But that dream is shattered when your spouse decides to try it, after months of saying how gross it is, and discovers what they’ve been missing out on. Then, you feel guilty for over-indulging, especially if you eat the last of your tasty treats. Until your spouse shamelessly admits to taking more than their fair share. Then the gloves are off. These are just a few of things about marriage that you didn’t (knowingly) sign up for. What are the terms and conditions of your marriage?